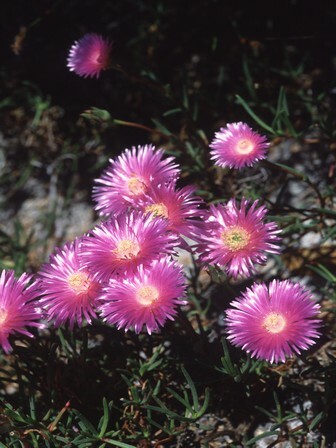 Mesembryanthemum tenuifolium L., Mesembryanthemum tenuifolius (L.) Rothm. A widespread (EOO 11 835 km²), but now very rare species, with only seven known remaining subpopulations. These are all small and isolated, and continue to decline due to ongoing habitat loss and degradation. The population is estimated to number fewer than 1000 mature individuals, and the largest subpopulation has about 200 mature individuals. Malmesbury to the Cape Peninsula and De Hoop. Deep, neutral to alkaline sands near the coast. This species has declined extensively on the Cape Flats due to habitat loss to urban expansion, and one of two remaining subpopulations is threatened by potential habitat loss to housing development. Further north towards Malmesbury it has lost habitat mainly to crop cultivation. Small remaining habitat fragments are densely infested by unmanaged alien invasive plants, and further loss to development (urban and industrial) continues as the city of Cape Town continues to expand northwards. Along the coast between Strand and Cape Agulhas most subpopulations known from historical records have been lost to coastal development, and loss is ongoing. Most of this species' remaining habitat in this area is also infested with alien invasive plants. This species was formerly common on the Cape Flats, where it is known from a large number of historical records. 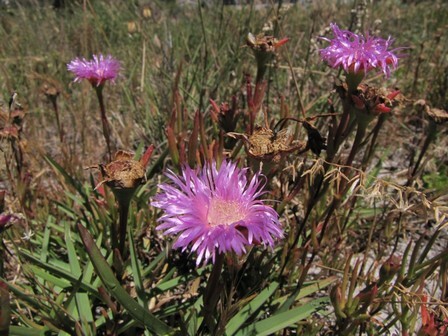 It is now however largely extinct in this area, and remains only in the Cape Point section of the Table Mountain National Park, where a small subpopulation of about 50 plants occur (C. Klak pers. comm. 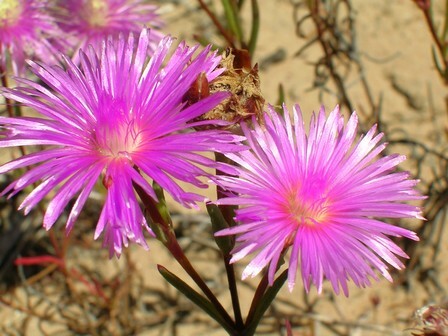 2006), and on a commonage near Kommetjie, where there are about 40 plants (N.A. Helme pers. comm. November 2012). It is known from a few scattered records further north towards Darling, and was thought to be locally extinct in this area, but two small subpopulations were recently discovered in habitat fragments in this area, the largest numbering about 200 plants. There are also a few small, isolated subpopulations remaining along the coast between Somerset West and De Hoop Nature Reserve. A subpopulation near Strand was lost to development (C. Klak pers. comm. 2006), and a subpopulation near Cape Agulhas was partially lost to a housing development. About 100 plants remain in this area. It was also recently recorded near Pearly Beach, as well as in De Hoop Nature Reserve. The population is severely fragmented and continues to decline due to ongoing habitat loss and degradation. It is estimated to number fewer than 1000 mature individuals.